AirAsia X wants to make your 'Hallyu' dreams come true. You must be living under a rock if you haven’t heard about the Korean Wave a.k.a. Hallyu. 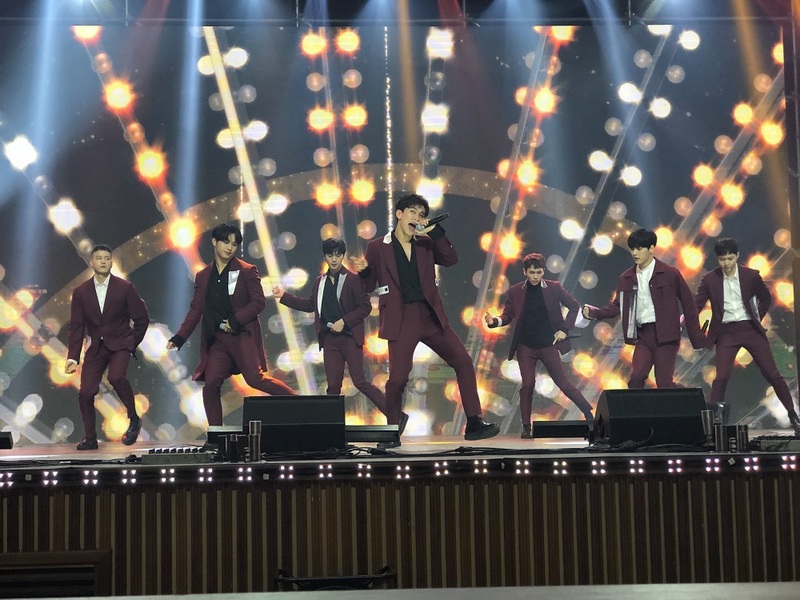 Made popular by the spread of K-drama and K-pop across Asia since in the 1990s, Hallyu has evolved into a global phenomenon thanks to satellite TV, the internet and social media. 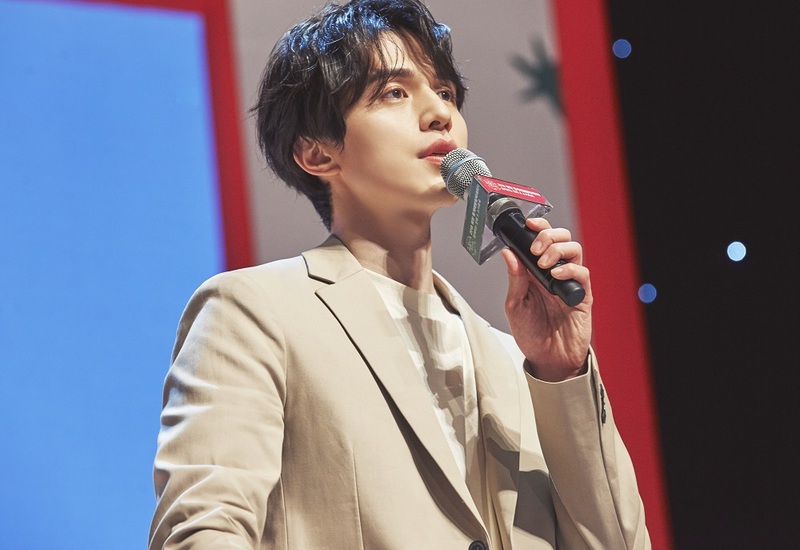 As cliché as they may be, it is practically every K-drama fan’s dream to live even a snippet of the lives of the good-looking Korean actors and actresses portrayed on the TV screens. 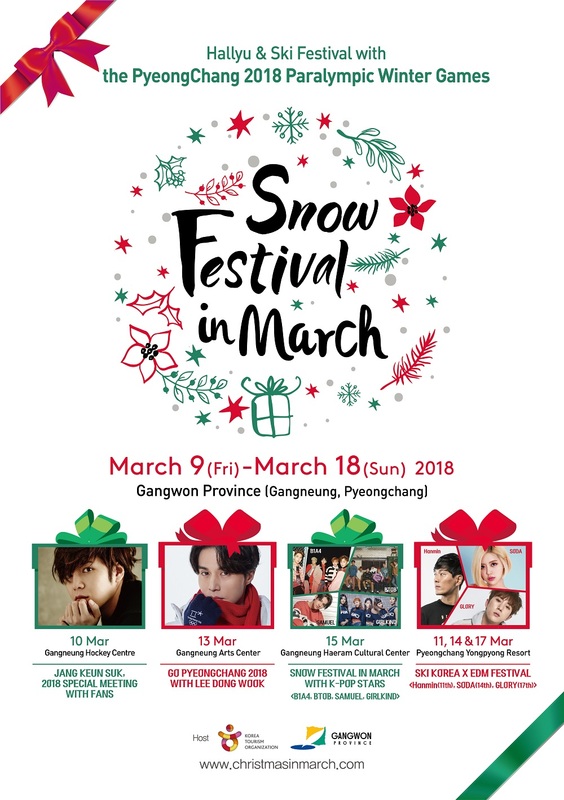 So imagine our excitement when we were invited on a whirlwind trip to South Korea to attend the ‘Snow Festival in March’ event last week! 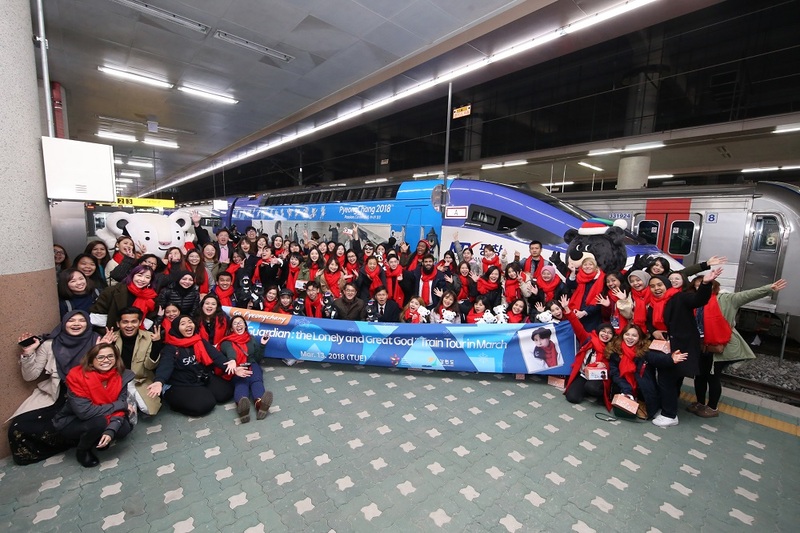 We landed in Seoul and hopped on the next train to Gangwon Province, where we were going to experience the complete Hallyu package. 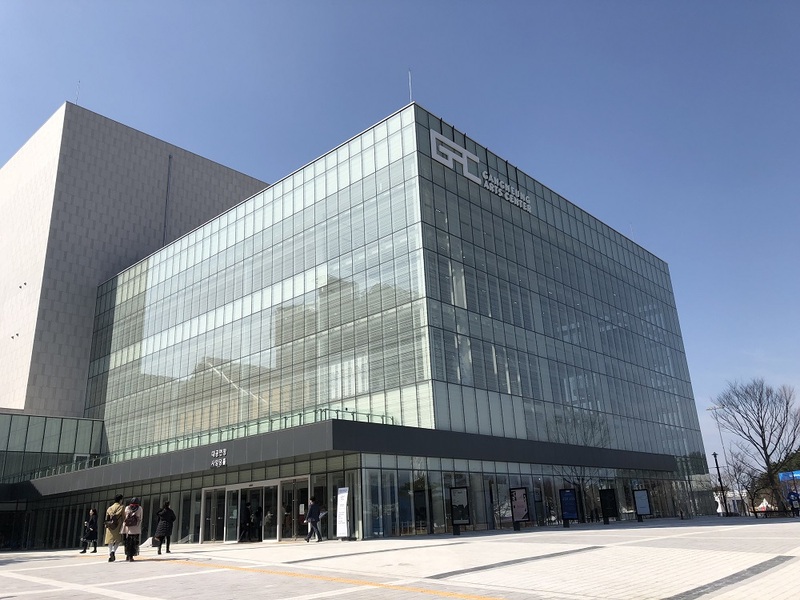 Now, unless you watch a lot of Korean TV, Gangwon may not be familiar to a lot of tourists because most of us only hear about Seoul, Busan and Jeju. 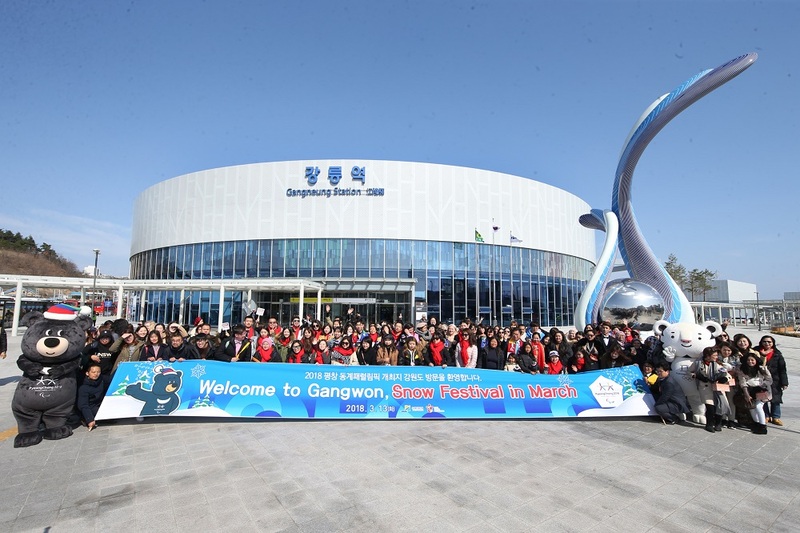 But we’re happy to report that Gangwon is only a 90-minute train ride away from the capital of South Korea! 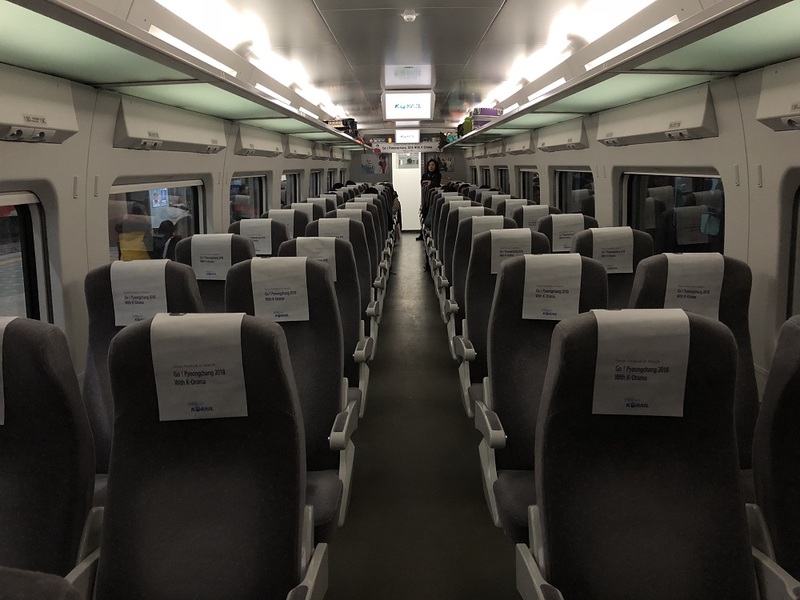 Ever since Train to Busan became a global hit, the world started paying more attention to South Korea’s high-speed rail system, Korean Train eXpress (KTX). 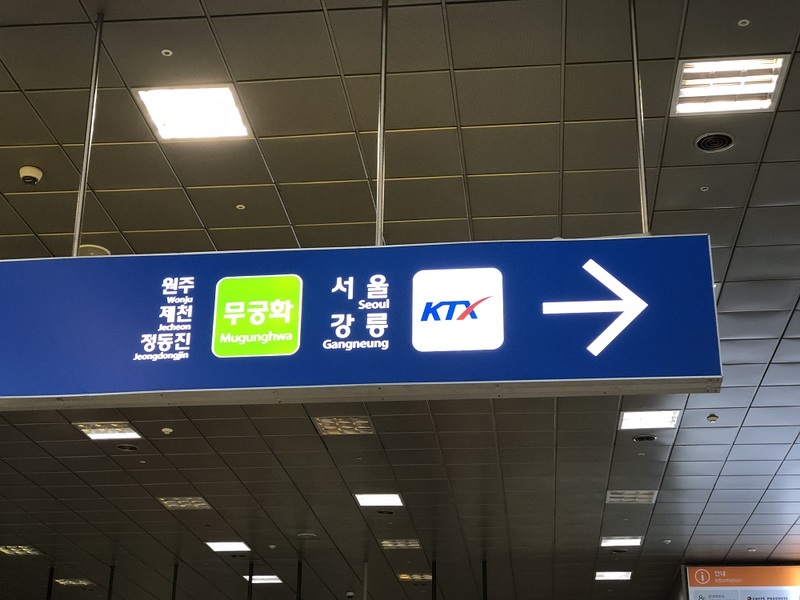 Besides Incheon International Airport and Seoul Station, another place where you can ride on the high-speed train is Cheongnyangni Station, located in Dongdaemun in Seoul. 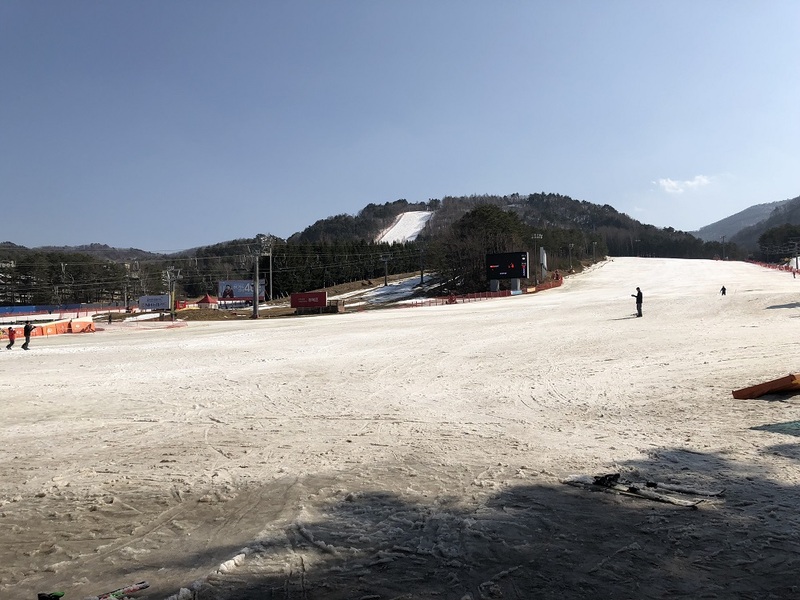 We started the day at Cheongnyangni Station heading toward Gangneung Station in Gangwon, which was completed just December last year to serve the 2018 Winter Olympics in Pyeongchang. If you recall what the train coaches looked like in Train to Busan, then that’s pretty much it. We’ve got to admit that there were moments when we could imagine ourselves in the zombie apocalypse with Gong Yoo, but we’re not here to talk about this particular movie. We’re here for a drama series starring the same actor, but not him exactly. 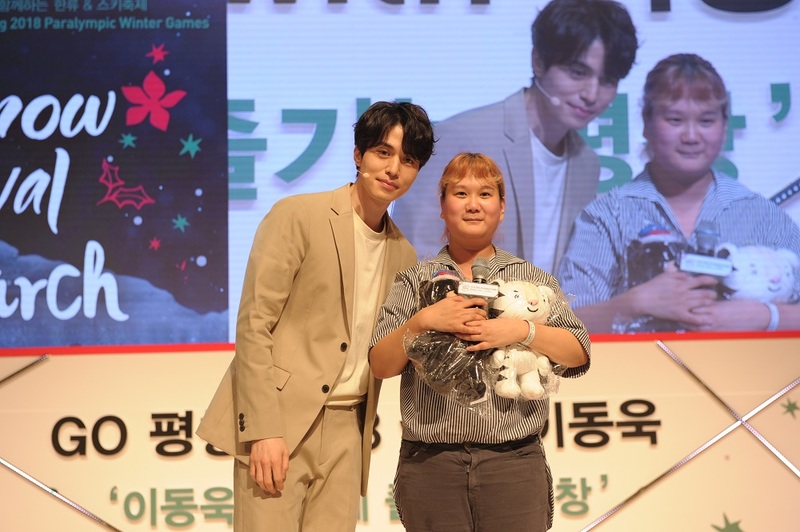 Lee Dong Wook, who played the Grim Reaper and Gong Yoo’s counterpart in Goblin, was appointed the honorary ambassador of the 2018 Winter Olympics and Winter Paralympics. 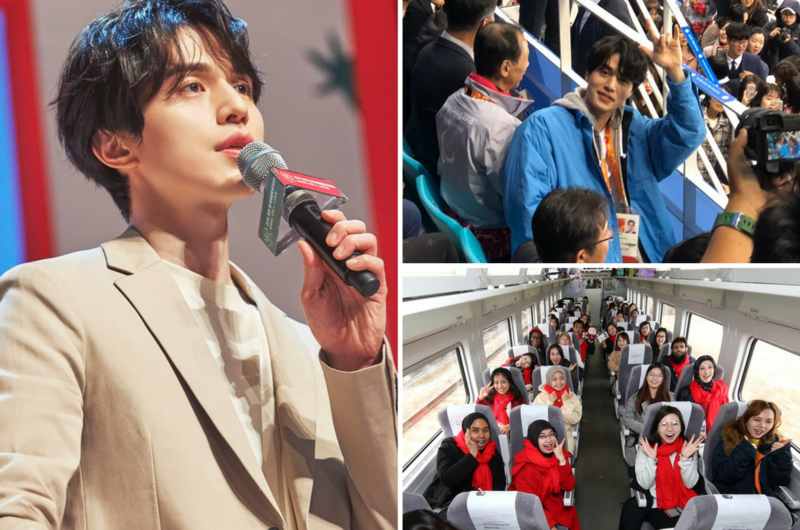 The handsome actor was supposed to join us on this train ride to Gangwon, but due to his hectic schedule, we were greeted by a cardboard cutout of him instead. 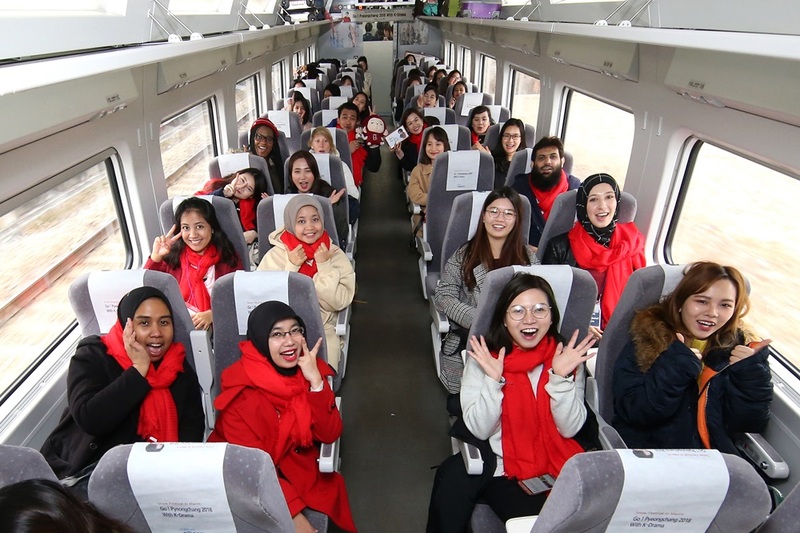 But that didn’t stop us from enjoying the Goblin Train ride because we were gifted with a few memorabilia from Goblin, including the red scarf made famous by Kim Go Eun in the series! 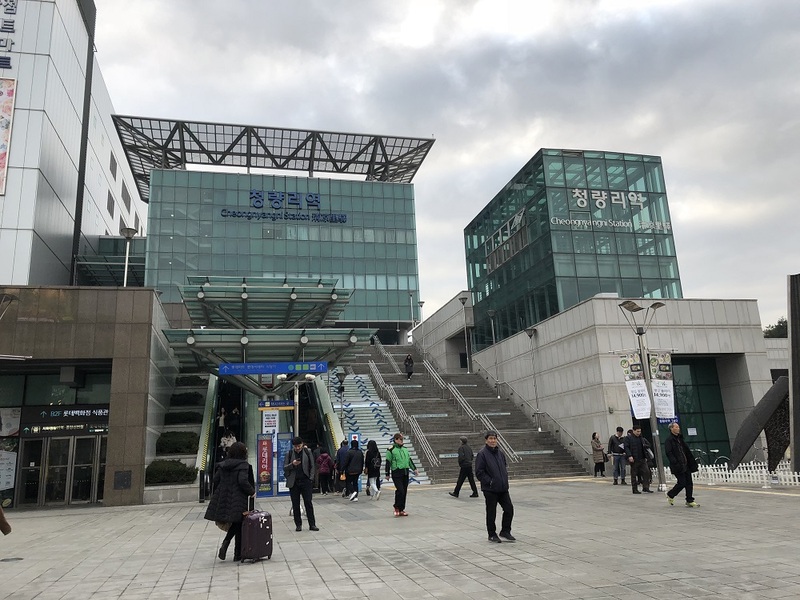 Upon arriving at Gangneung Station, the air felt different because we knew that we were one step closer to the ultimate K-drama experience. 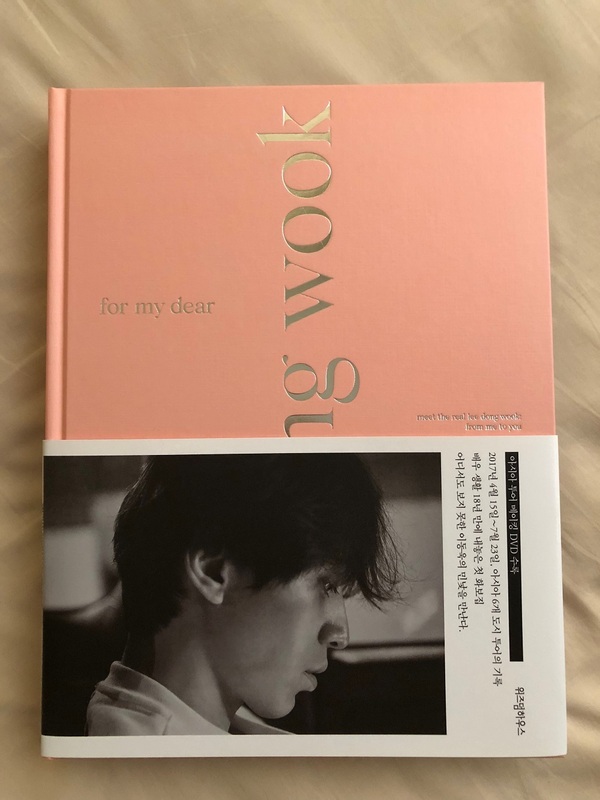 We were led straight to the Gangneung Art Center where we were going to see Lee Dong Wook at the ‘Go Pyeongchang 2018 with Lee Dong Wook’ fan meeting. 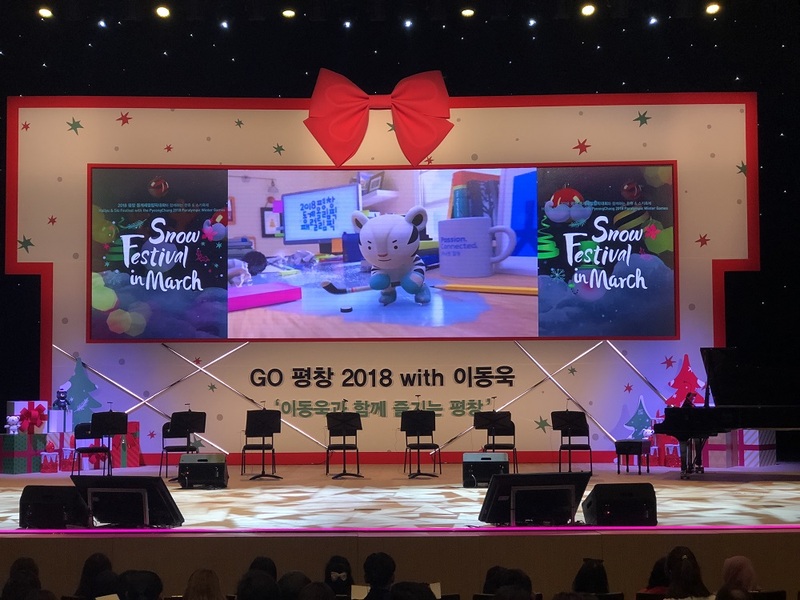 As with any other concert or fan meeting, the fans arrived at least two to three hours before the event, even though everyone had tickets with numbered seats. You wouldn’t understand if you’re not a true fan. At first, we were thinking how were we going to sit through the entire session if we didn’t speak a word of Korean. It’s not like they were going to conduct the meeting in English, right? 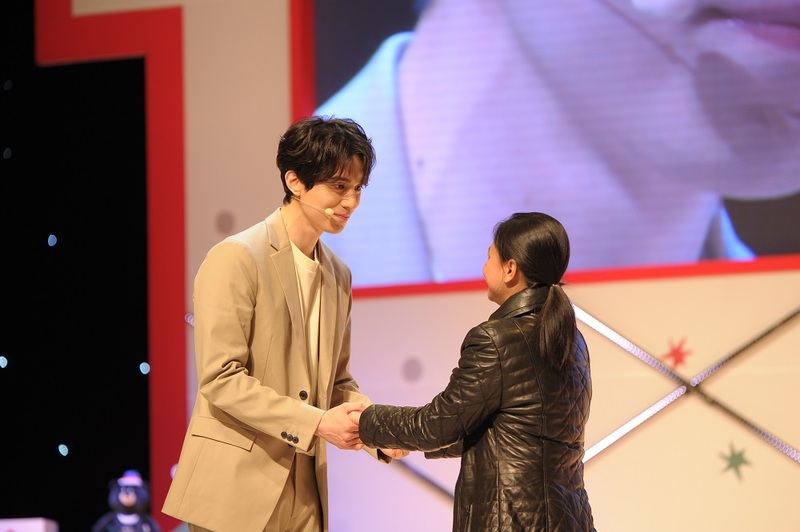 On the other hand, we didn’t mind just staring at the actor for two hours even though we wouldn’t understand a single word that came out from his mouth because… well, you know why! Our concerns were immediately shut down when we found a counter giving out hearing sets. Each foreign fan was given an earpiece for us to listen to translation in real-time in three languages! We could choose between English, Chinese and Japanese. The attention-to-detail blew us away. 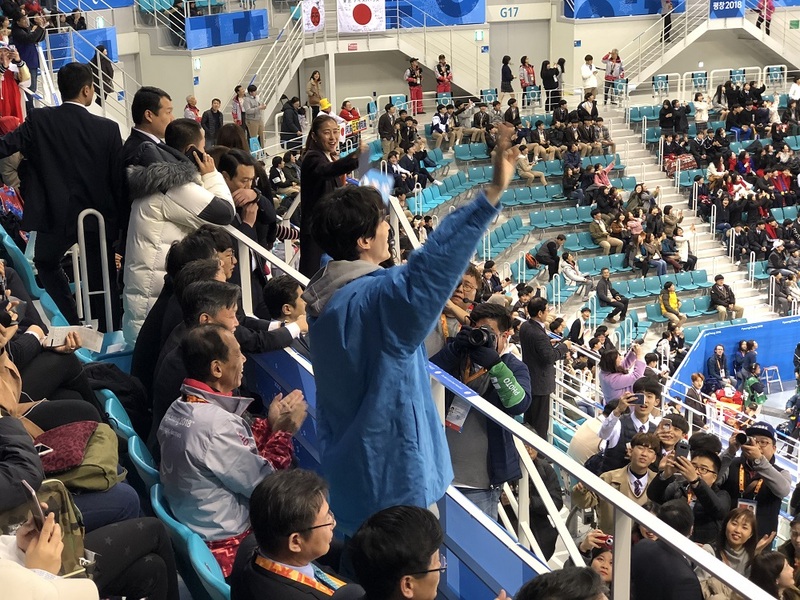 Once we got to our seats, they announced that nobody was allowed to take any photos or videos throughout the session because they wanted everybody to truly experience Lee without any distraction. And true enough, there were bodyguards stationed at every corner of the hall to make sure that no one had their mobile phones or cameras up. It felt like the President and his Secret Service team. 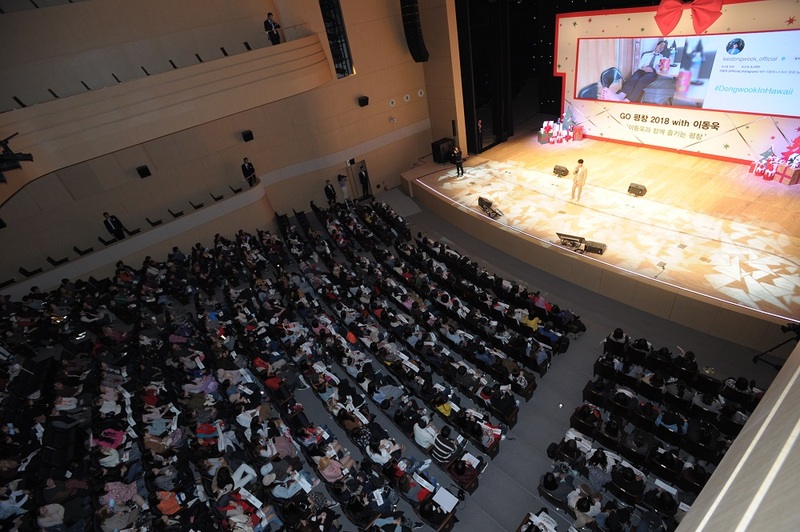 Then, at 3pm sharp, the actor appeared on stage. And the entire hall was completely mesmerised. 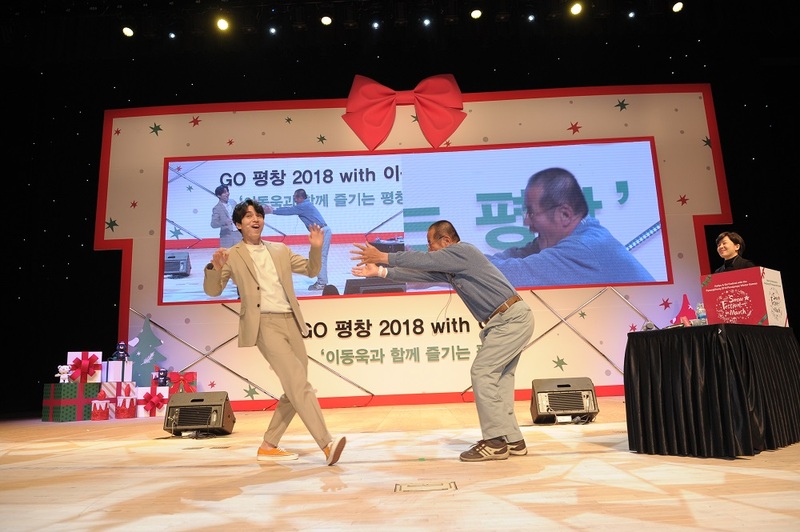 In the next two hours, Lee showed off his never-before-seen photos in a segment he charmingly titled ‘Wook-stagram’, gave away ‘Wook-candy’ to a couple of lucky fans who had special stickers stuck under their seats and played games with more lucky fans on stage, including a staring contest! The hours flew by within the blink of an eye and we didn’t even realise that we hadn’t taken any photographs to commemorate the moment. But it didn’t really matter at the time. 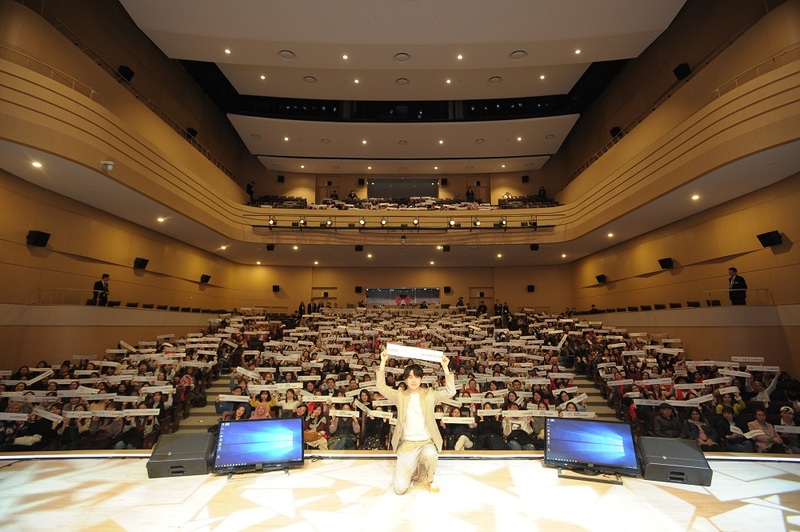 Every fan left the hall with butterflies in our stomach and a large photobook personally autographed by the man himself! 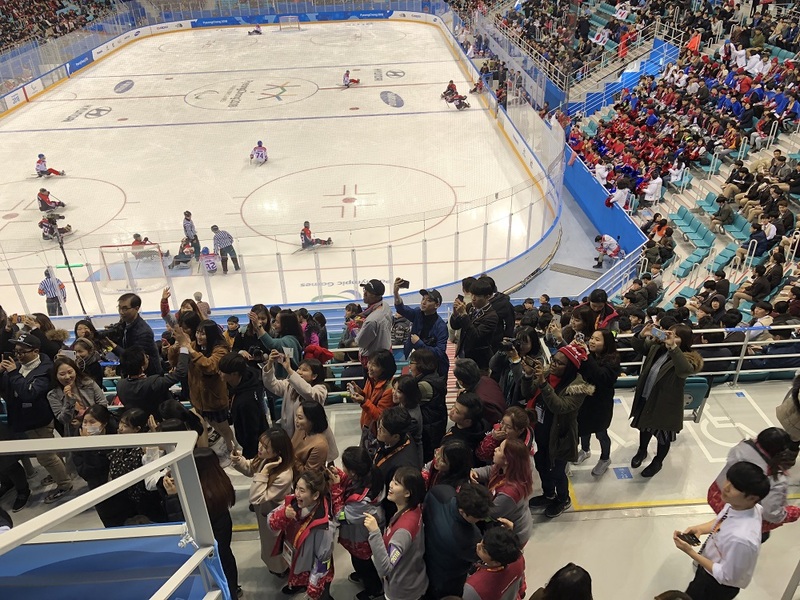 As the honorary ambassador of the Winter Paralympics this year, Lee wanted his fans to have a chance to watch at least one game in Pyeongchang. 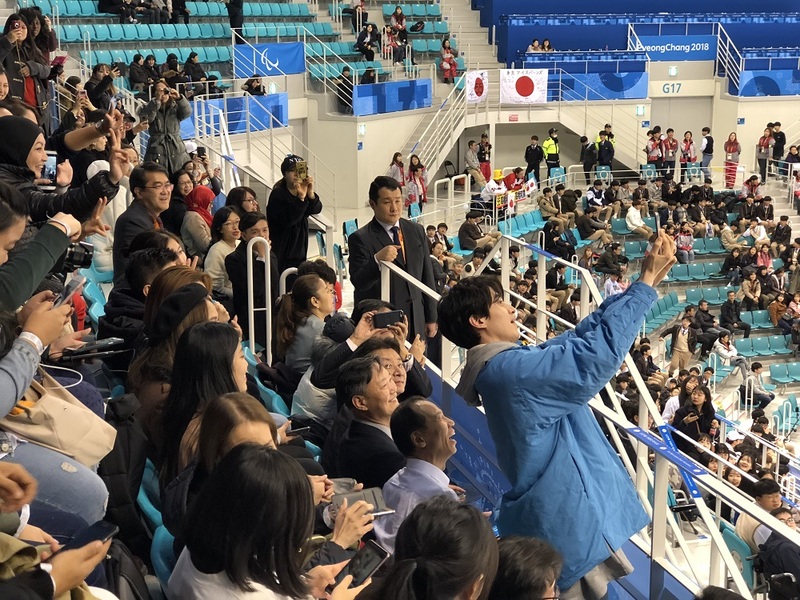 So the generous actor bought tickets for his fan club to watch one of the ice hockey matches! Lee had spent around USD10,000 on 1,000 seats for his fans to catch the Czech Republic vs Japan game with him and we were one of the lucky ones! Let’s just say that a lot of us were a bit distracted from the actual game for a while. 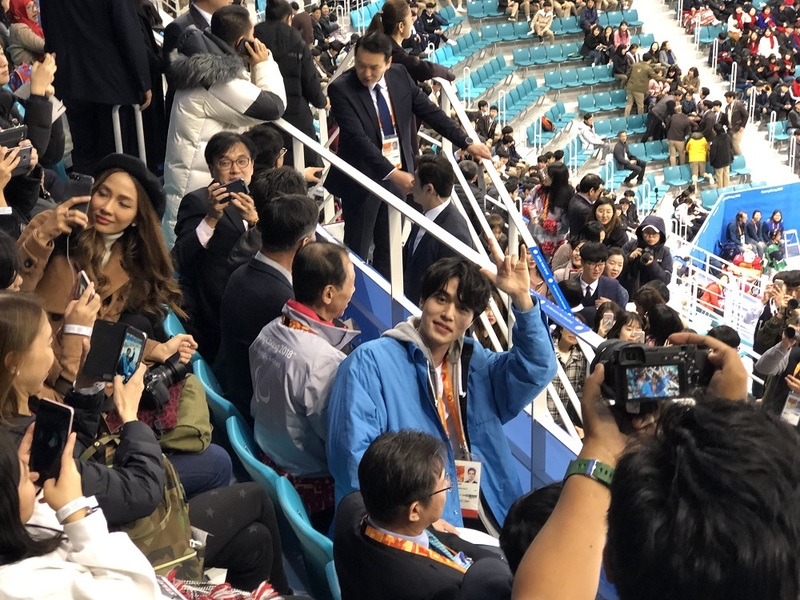 When Lee noticed that people were watching him more than the game, he quickly requested everyone to take a seat and enjoy the match instead because that’s the main purpose of the evening. But we did steal a few more shots of him because this is a once-in-a-lifetime opportunity! 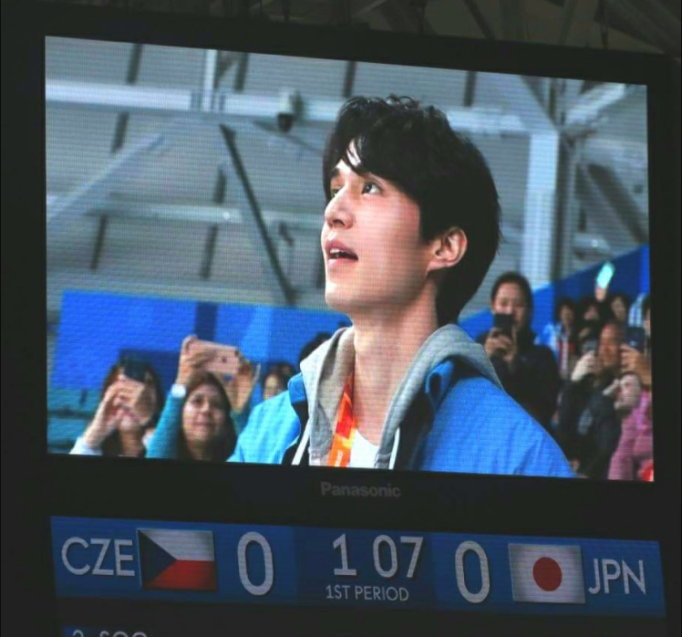 The night ended with Czech Republic winning 3-0 against Japan. And with heavy hearts, we finally said goodbye to the actor. 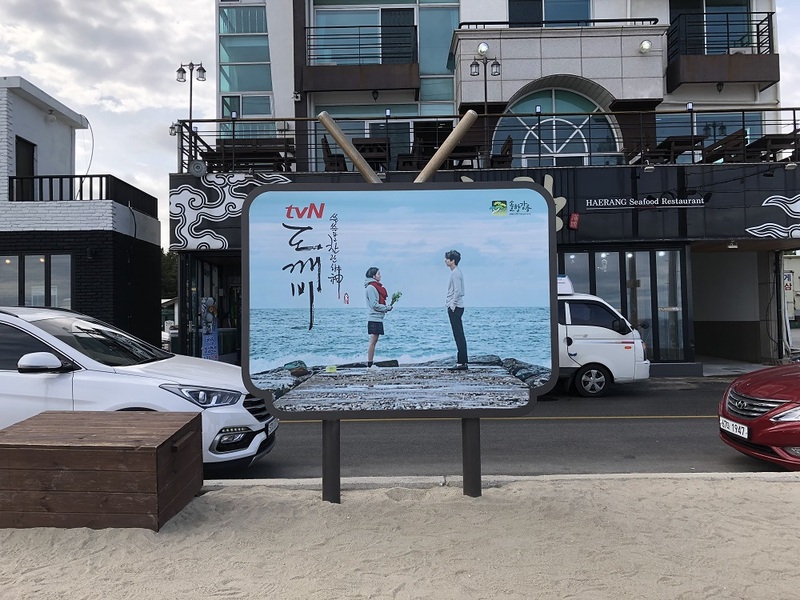 Besides meeting the actors we see in our favourite K-dramas, another dream of every fan is most probably to visit the filming sites of these series to breathe the same air as the likes of Lee Dong Wook and Gong Yoo and take a million pictures. And that’s what we did during the rest of our stay in Gangwon. We stayed at Yongpyong Resort, which happens to be one of the filming sites for Goblin. The next morning, we took the Rainbow Gondola up to the top of Dragon Peak. 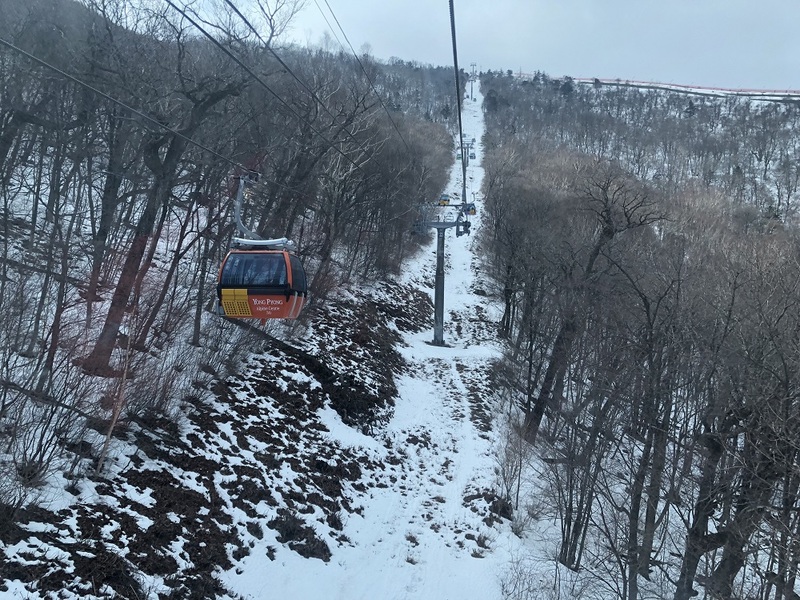 This is the exact gondola portrayed in one of the scenes where Kim Go Eun met Gong Yoo at the mountain peak. It is also the same gondola featured in what was regarded as the K-drama that started the Korean Wave, Winter Sonata. 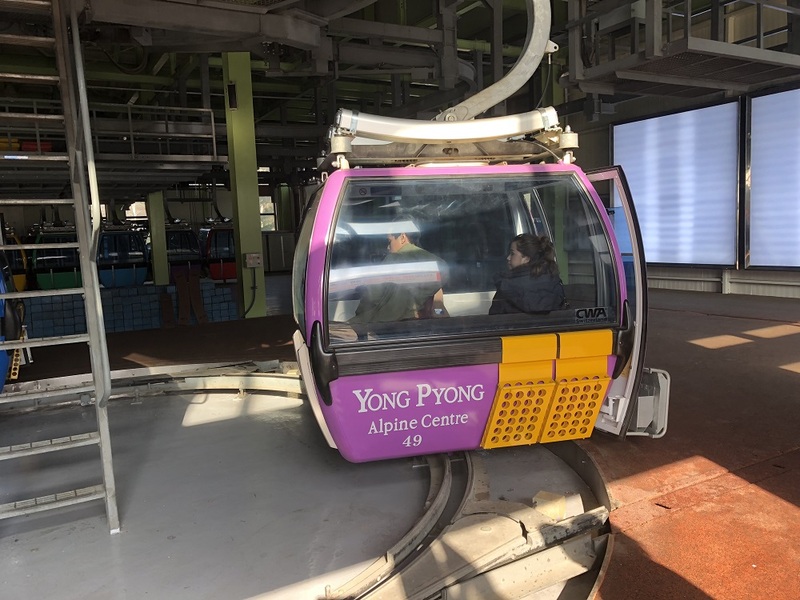 The Rainbow Gondola is Korea’s longest sight-seeing gondola which offers a fascinating view of Balwangsan Mountain. 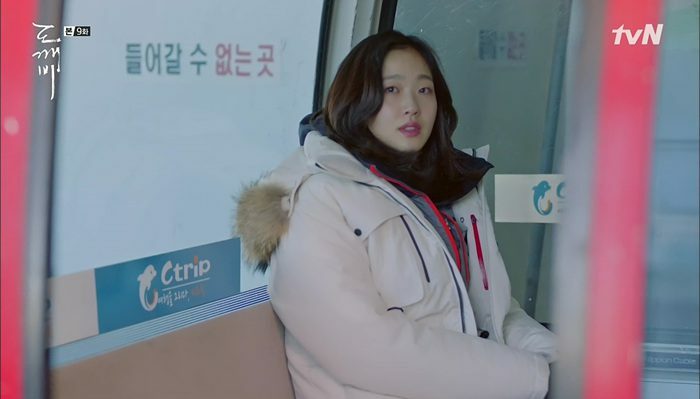 Then, in one of the episodes of Goblin, the female character Eun Tak is seen working part-time at a ski resort. 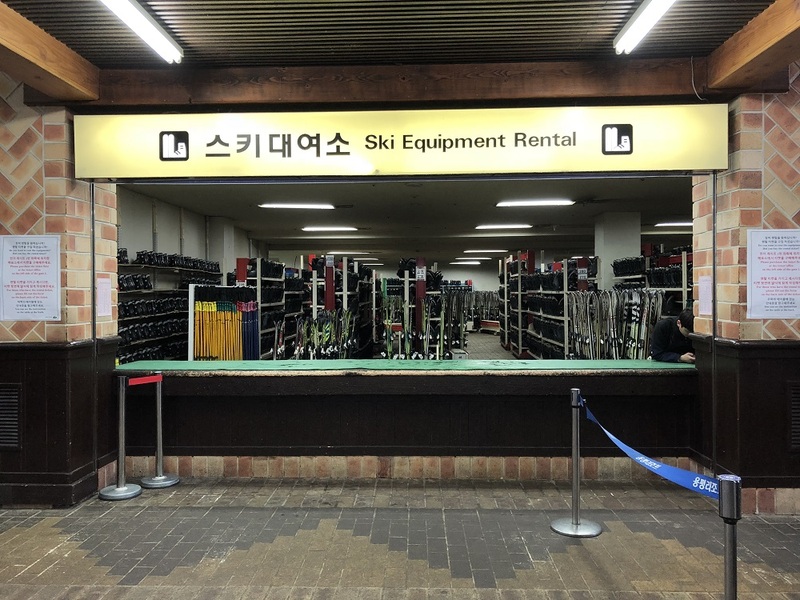 This place is none other than the Dragon Plaza Ski Rental Shop at Yongpyong Ski Resort. 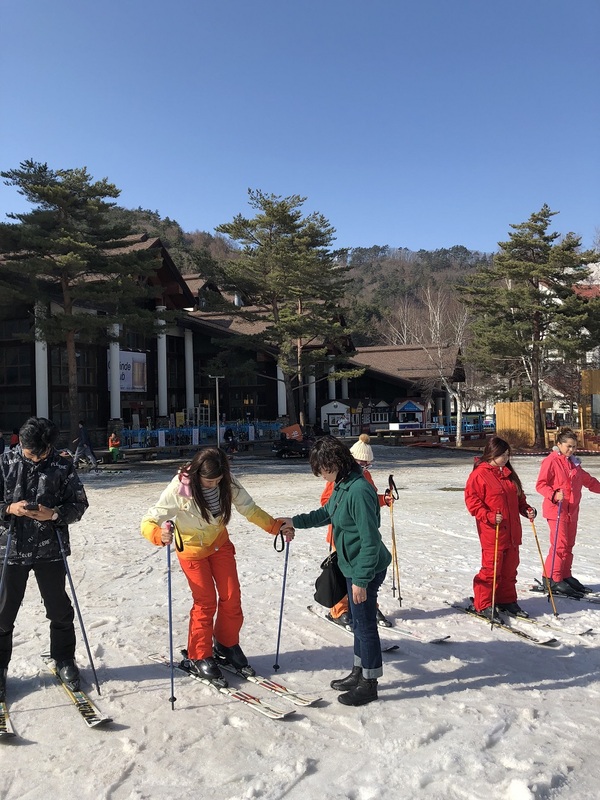 We even got a few ski lessons here to fully immersed ourselves in the land of K-drama! 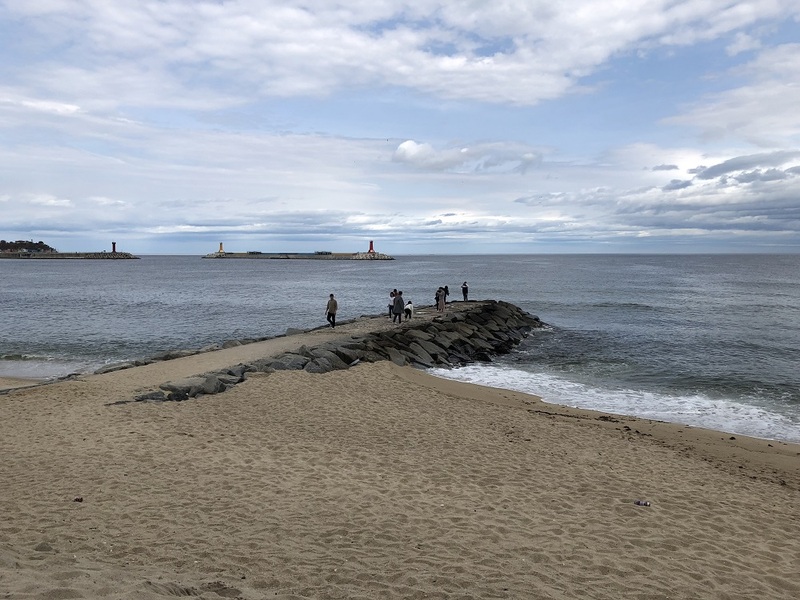 After spending some time at Yongpyong Resort where the two popular series were filmed, we headed to Jumunjin Breakwater. 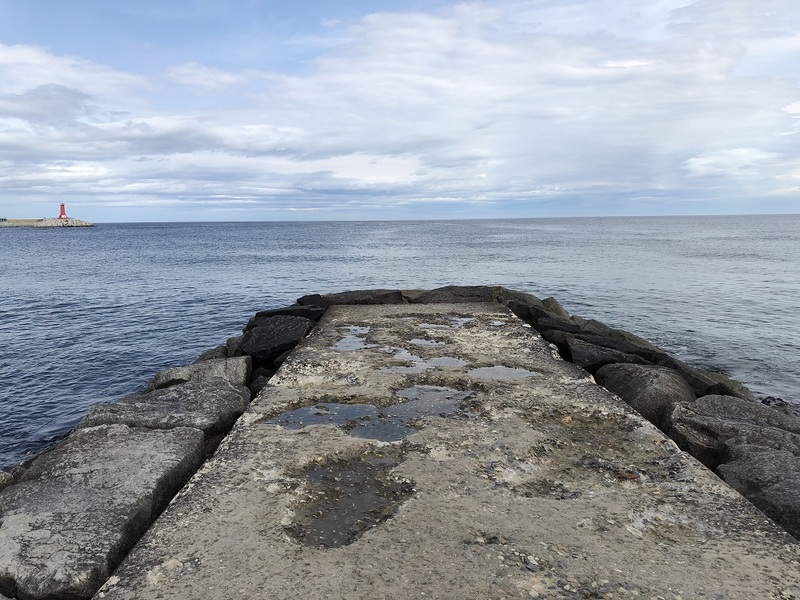 Before Goblin, there wasn’t anything unusual about it besides being a place that was built to protect the coastline from the effects of erosion and longshore drift. 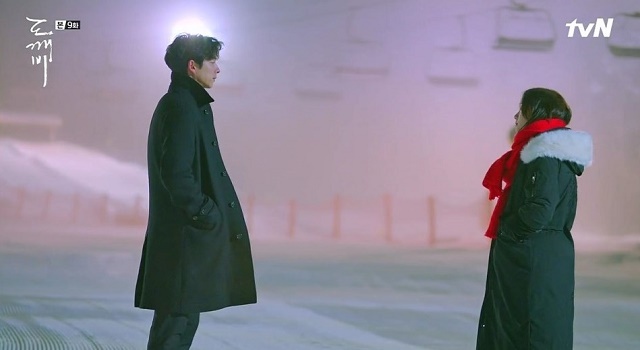 However, it became a popular attraction after it was seen in the drama where Gong Yoo and Kim Go Eun filmed one of the most romantic scenes in the history of K-drama. Since then, many visitors and tourists would come here to take pictures reenacting the scene from the drama. We were lucky that this spot surprisingly wasn’t crowded with people that day. So, of course, we became the ones taking a million pictures with a non-existent Gong Yoo. 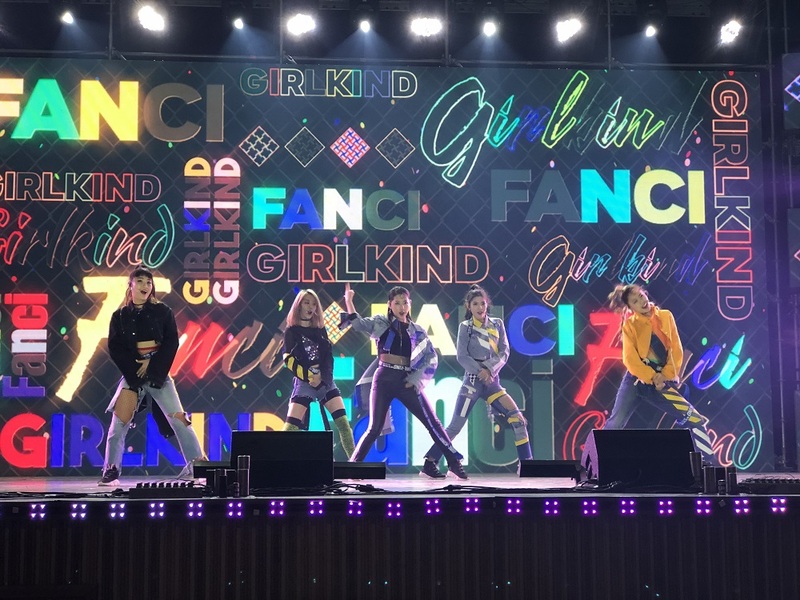 We can’t say that we have lived the ultimate Korean fan’s dream without experiencing a bit of K-pop, right? 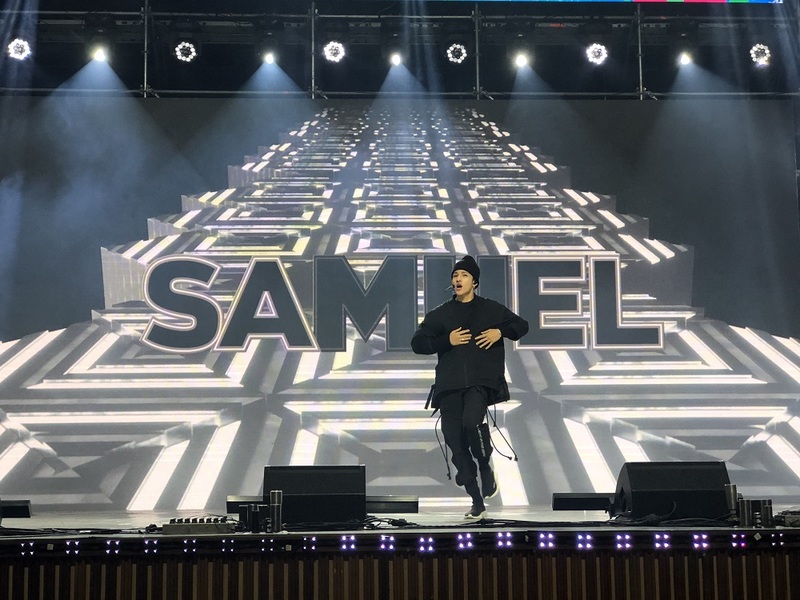 On one of the last evenings, we headed to Gangneung Haeram Cultural Center in Gangwon to see some of the most popular K-pop stars at the moment, BTOB, B1A4, Samuel Kim and Girlkind. 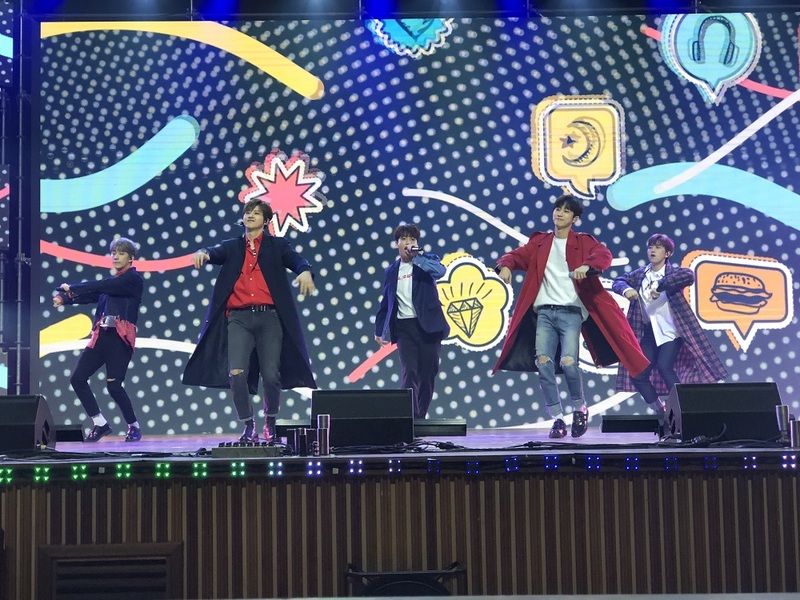 We even got to see B1A4’s Jung Jin Young who starred in Love in the Moonlight with Park Bo Gum and Yook Sung Jae who was popularly known in Goblin up close and personal! This was indeed a rare opportunity for us, but it is not the only chance we got because you can also have your own Hallyu experience with everyone’s favourite low-cost airline Air Asia X.
AirAsia X flies to Seoul up to 18 times weekly, and this week, you can fly to the South Korean capital from as low as RM249! Book from 26 March to 1 April 2018 and travel between now until 30 September 2018. Look no further, get your tickets now and hop on the next flight out to the land of your favourite Korean actors!